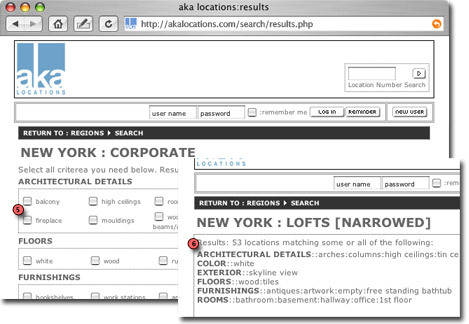 At any point during a search on our site, you have the option of directly finding a location by its number. Our standard location numbers are 5 digits long, typically beginning with one or more zeros. Numbers based on our old numbering systenm will work as well. Simply type the number into the 'search by number' box (1) and click 'search'. You will automatically be taken to that location's details page. Once you have chosen a region to search within, you will need to narrow the type of location you are looking for. On this page you will see a list of larger category 'drop down' menus (1), each of which contain narrower examples of the larger category. You may choose the larger category, likely returning a very large result set (the number of locations on file is in brackets to the right), or one of the smaller categories. 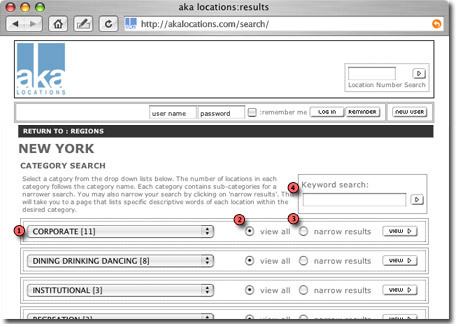 As well, you may choose to view all of the locations in a category (2) or narrow the possible results (3) (see below). And finally, from this page, you may try a 'keyword' search (4) (see SEARCHING BY KEYWORD below). If you click on 'narrow' to search a category, you will be presented with all of the various descriptions (5) associated with locations in that category. 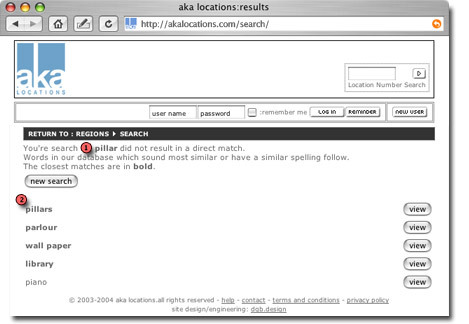 This way if you wanted to find only those locations with specific features, you could narrow your results to just those. Results would be returned listing the details you requested (6) at the top of the page and in order of relevance, i.e., its not likely that all locations returned will share all the features you sought. Those at the top of the list will share the most. If you entered a keyword on the search page (see SEARCHING BY REGION above) and it results in a direct match to a word associated with a location or locations, a list of matching results will be returned directly (see SEARCH RESULTS below). If, however, there was no direct match, a list of the five words that are the closest matches will be returned. Those that are above a 70 percent liklihood will be in bold. The liklihood is determined in two ways: 1) by the similarity of the word's spelling to words in our database based on a method outlined by J. J. Oliver in Decision Graphs - An Extension of Decision Tree  and 2) by the similarity of the word's sound to words in our database based on a method outlined by Lawrence Philips in Practical Algorithms for Programmers . The first method accounts fairly well for 'typos' and the second for spelling uncertainty. Furthermore, we have mapped many words assigned directly to our locations to a synonym table to account for diffrerent naming practices. Results are returned in a list format as seen above. The top of the page lists the (1) region and category or keyword searched for. If the results have been narrowed, this will follow the catogory name to let you know you are not seeing all the results for this search category. The number of results (2) can be seen just under this. Results may be sorted (3) according to various criteria. 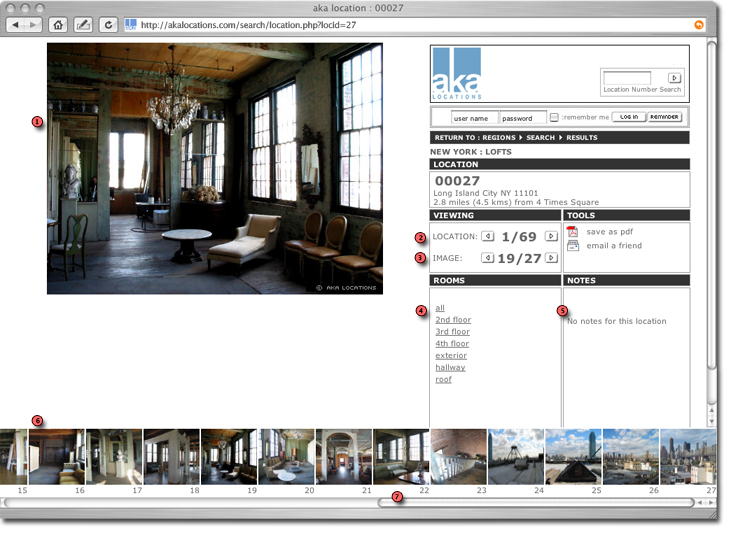 Clicking on either a location image or its location number (4) will take you to the details page for that location. Other helpful information such as the location's city, zip code and distance from the region's center (based on sperical point to point calculations) can also be found, if available, on this page. Tools (6) for creating pdf's and emailing are at the right. For more information on these tools please see USING WEB TOOLS. The location details page shows all the images for a given location. The left panel displays a large view (1) of one of the small thumbnails (6) at the bottom. To navigate through the thumbnails you may either click on one of them or use the left/right (3) arrows. Please be aware that some locations have many images - so be certain to check for a horizontal scrollbar (7) at the bottom of you browser window. If we have broken down a location by room, you may reduce the visible thumbnails at the bottom to show only images from a specific room (4). Also, you may find notes for that specific location (5), such as permit requirements and availability dates. To return to the results page, use the navigation bar at the top of the page. If, however, you wish to simply view the next or previous location, use the left/right arrows (2) found above the image navigation arrows. While you can do full, robust searches of all of our locations without being a registered user, you will not have access to extra features, such as emailing locations and creating favorites folders. These features are only available for registered users. To register, click on the 'new user' link (2) and follow the directions from there. If you are already registered (1), you will need to type in your user name and password, check the 'remeber me' box if you wish to remain logged in, and click the 'login' button. If you have forgotten your password, click the 'reminder' button and follow the direction from there. At any time when you are logged in, you may edit your contact and login information as well as you preferences. Simply click on the link 'Welcome your name' at the top of each page to get to your personal information. When you first register, you are automatically signed up for email updates. These are sent out to keep you informed of additions to the site as well as changhes to our policies and other information we feel may be of interest to you. You may change this option at any time. At any time when you are logged in, you may create and manage personal collections of locations, called folders, from our site. If you wish to view location folders you have created, which will also allow you to edit them, or if you wish to create a new folder, you may do so via the drop down menu (1) on the account bar at the top of the page. To add locations to your folders, select the desired folder from each drop down (2) menu on each location result. For information on editing individual folders, see USING WEB TOOLS : USING FOLDERS below. 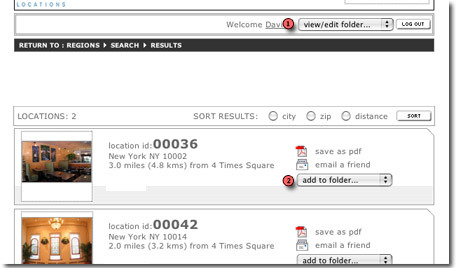 If you are logged in you may create and download a PDF file of a location by clicking on next to each location. This file will be automatically downloaded to your downloads folder on your computer (this is often set to "desktop"). You will need the free Adobe® Reader® to view this file. It is available here. The PDF file will contain a cover page with details about the location and all images for that location. You may keep this file for your records or forward it to someone else, however, be advised that this PDF file is for your personal use only and is being provided to you as courtsey. Adobe® and Adobe® Reader® are registered trademarks of Adobe Systems Incorporated. All rights reserved. If you are looged in you may click on next to each location to conveniently email a location link to up to five different people. 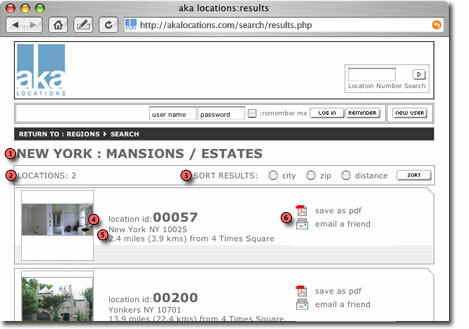 Alternatively, if you are viewing a specific location's details page, you may copy and paste the URL from the address bar of your browser into an email. The link should look like this: "http://akalocations/search/location.php?locid=23", where the last number is the identification for the location. Both mehtods will have the same results for the recipient of the email. When you are viewing the contents of a folder, you will see the name you assigned to the folder in the tab at the top left of the content list. Folder contents may be viewed in the same way you view normal search results. You may view/edit folders via the drop down menu (1) on the account bar on the top of each page. You may add locations to a folder via drop down (3) menus on each location result. You may change a folder's name, email a link to an entire folder, or delete a folder with the folder editing tools. To delete an individual location from a folder, click the delete button on each location. We are constantly adding locations to our database. One way we find new locations is through visitors to our site. If you are the owner of a location, or would like to recommend one to us, please feel free to submit it through our location submission page. Here you may also submit a photo of the location. Please read the file submission guidelines. Alternatively, you may email submissions to us at info@akalocations.com. We display current weather conditions for each region where we have locations. These data come from the National Oceanic and Atmospheric Administration's (NOAA) National Weather Service (NWS). Observed weather conditions are updated on the NWS server once an hour, usually just before the hour. We then update our database with this information at a quarter past the hour. These data are supplied as a courtesy and we can make no claim as to their accuracy. You are encouraged to determine for yourself the weather conditions for each location you wish to book through us.